As was mentioned in Part 1, birds are such a varied an interesting form of life that they can inspire one’s writing – mythological or otherwise. I’m well aware that the subject of birds is hardly an original topic; after all, everyone knows that birds can be elegant, graceful, delicate and resilient, right? Why else would a Brit call a pretty woman a bird, or we sometimes say that someone sings like a canary, or struts like a peacock or has the eyes of a hawk? This list goes on. Today, though, we’re gonna cover fear. And yes, we’re still on the topic of birds. I recall being very frightened of what I always called “owl eyes” when I was a young child. The image of a pair of eyes, staring at me from the dark, was apparently enough to keep me from venturing outdoors at night. These days, I’m happy to report that while seeing some eyes in the dark might be alarming, but that childhood fear has evolved into a less-than-rational discomfort with this creature, the barn owl. Cute and scary in one lovely package. It looks vaguely human enough for me to prescribe human emotion – or lack thereof – in its face, and as any student of fear knows, things that that resemble the familiar are creepy. Something about the cold, indifferent gaze of a barn owl, say, while you lay bleeding in the woods at night would make a fitting keystone of terror in my book. I’ll never forget that split-second scene from Milo & Otis. I managed to harness this imagery in creating a notable character, a parasitic evil spirit from the Void, in my novel-in-progress. In designing and describing the character, I had hoped to emphasize the character’s familiarity – perhaps he may have once been human – while evoking the same sense of dread that I at times experienced looking at a barn owl. Now, as a fantasy writer I often find myself straddling the line between being “imaginative” and “superstitious,” not that they are mutually exclusive. I don’t believe in reincarnation, but I’ve pondered it for years and think it’s a great idea. Now, if ever I had a previous life, I have a strong notion it was as a prehistoric person that was killed by a terror bird. I mean, come the hell on. The fact the these things actually existed only serves to amplify the primal fear I get when imaging them. Heck, I got a kick out of that forgettable movie 10,000 BC, but the terror bird scene? The sounds made by the beasts in question genuinely made me nervous. Okay fine, there’s a good reason to be afraid of any creature that would consider you a meal. Surely, Jesse, there’s something unique about these animals that makes you remember the time you were doing a childhood sleepover at a friend’s house – then after watching the scene in Encino Man where Link finds himself in a museum, seeing the bones of prehistoric creatures from his old time – and the sound designer for that movie played various animal calls during the close-ups of the displays, including the skeleton of a terror bird – and the the sound scared you so much you had to go back home that night? No sir. No good reason at all. Perhaps it was that event that shaped my thoughts regarding terror birds. The writer-side of me wants to imagine that I possess some sort of genetic memory of these things, but probably not. The analytical side of me, on the other hand, simply recognizes that I’m probably just unnerved by titanic parakeets. Seriously, though, a bird is sort of the step in between a dinosaur and a mammal. There’s a certain otherness to birds. I get the same vibe when being eyeballed by a snake or a fish, as if a predatory creature such as these might look upon me and think “We have nothing in common, so I have absolutely no reserves in eating you.” Not that predatory birds/reptiles/fish/mammals don’t eat other mammals/fish/reptiles/birds, but I thought I’d just s hare the angst. So today, I shall tell you, dear readers, about my latest project. As some of you may know, the Writer’s of the Future contest deadline is approaching, and only recently did I have a story concept developed enough that I wanted to really pursue it. Lo and behold, 1.5 weeks later and with about one week left, I’m on a roll, spinning this tale like a potter atop a merry-go-round. One of the fun things about writing stories, for me anyway, is some of the back research needed to set the tone and detail the setting well. The story I am writing for the contest, which I’m torn between entitling “What Happens To Dead Vultures?” and “The Phoenix Pearl,” is, as you might have inferred, about birds. When it’s complete, perhaps I’ll shamelessly make a link to a post somewhere online for public viewage. The story is more or less a creation myth, as told by what we know today as vultures. There are some familiar characters – cranes, eagles, a condor and hell, even a goose. This is not Animal Farm, this is more along the lines of Hero’s Journey myth. One can never run out of cool stuff on Wikipedia. I was astounded by this thing. 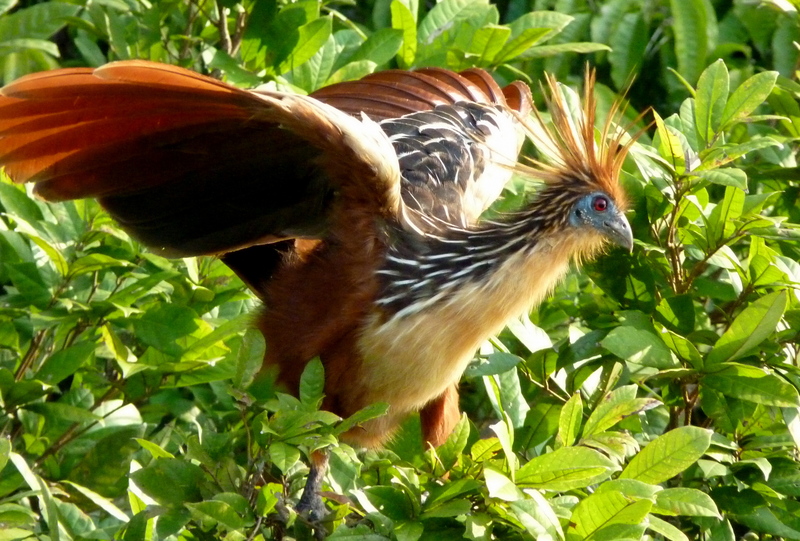 Why haven’t I heard about a hoatzin before? Now, I suppose I could dedicate an entire post to birds – I have a sort of thing for animals and science – but looking at this creature, I could invent a myth about it. There’s something awfully phoenix-y about it, eh? Despite the fact that it makes its home in the branches of Amazonian trees. Birds symbolize things we’ve all heard before: grace, freedom, flight, pride and all that. But they’re often misunderstood, or simply not understood at all. You know all that lovely singing you hear when going for a stroll in the woods? Those sparrows and larks aren’t singing because they’re happy, they’re essentially shouting off rivals and cat-calling mates. I’ve seen similar behavior on the streets of New York near a construction zone. There are thousands of birds to choose from for any amount of reasons. The hoatzin I displayed above is not necessarily my favorite bird, but it makes the list of newly discovered Top Ten. Maybe one of these days I’ll actually post a list. During part 2 of this Inspire: Birds series, though, we will discuss birds that inspire fear in yours truly, and I’ll talk about how I harnessed that and use it in my writing. Until next time, consider from what birds might you derive inspiration. Let me know if you’ve a favorite, even! Not long ago, a bout of writer’s block was abolished for me when writing a chapter. In it, a character has descended into a flooded mine in pursuit of a wanted criminal. In writing this scene, and the chapter to follow, I had to (and will) draw on experiences I’ve had in deep, dark places. I feel like a cave or a mine is one of the most oft-writ locales for adventures, but I ask myself: how many of us have actually been in such a place? Like really in there, deep? I can’t call myself a spelunker, but I’ve been in a few deep places now and again. The earliest memory would be a place called Howe’s Cavern, a natural formation open to the public. I recall as a youngster getting on the big elevator after passing the cheesy mineral gift shop and descending into a place not altogether different from my gaming experiences of Dungeon Keeper and Diablo (1!). I was never scared while there, they did a good job in keeping the place family friendly and safe. Not so for a zinc mine I had seen during my foray in New Jersey. This place had a very different feel from the ancient, natural, close-to-the-earth vibe from Howe’s Cavern. In this zinc mine, which I ought to mention was abandoned, they held tours showing people down under the mountain and deeper than any creature of the sunlit world has any right to go, and we passed a number of death holes. I don’t recall precisely why the place was no longer in use – either flooding or exhausting of the resource – but like I said there was a very different feeling down there. We were told stories of miners who went even deeper than where we walked, how children were used for manual labor, how there were occasional lethal gas leaks. It’s easy to read about these things in books or blog posts and have facts and figures memorized. Everyone knows they used canaries in mines because the birds are famous for being quite vocal, so when they died (due to scentless gas), there was uncanny silence. Meant it was time for the miners to get the hell out. I won’t even get into the miserable giant insects that have been discovered down in the subterranean world. No thanks. Almost as bad as jellyfish. Personally, I’d rather seek out magical turtle spirits. The takeaway? Visit a mine, check out a (safe) cave. When you’re down deep enough, there really is not feeling like the knowledge of thousands of tons of rock between you and the surface world, the sound of wind as foreign as an animal call from some exotic land. Down there, it’s quiet as death.